At the height of allergy season, incorporating nettles into your meals can be a soothing practice offering relief. With research supporting the use of nettles for seasonal allergies and hay fever, this plant contains anti-inflammatory and immune boosting properties (Learn more about the benefits of nettles in our story on them). It is also rich in vitamins, minerals, and antioxidants. Nettles care commonly cooked into a tea, but they also make a flavorful sauce. 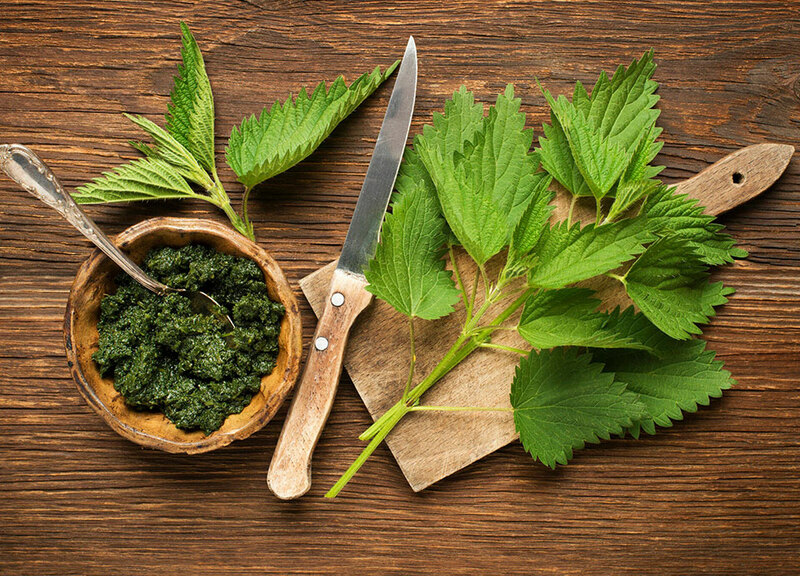 Never eat or touch fresh nettles; heat neutralizes the volatile compound that sting so some type of processing is key before you consume them. If you don’t have access to fresh nettles, dried nettles can be ordered online or you might find them at a Farmer’s Market. Enjoy this fresh nettle pesto today on whole wheat or bean pasta or your favorite vegetable noodles. Bring a large pot of water to a simmer. Add the nettles directly from their bag and cook, stirring continuously, for 2 minutes to denature their sting. Be careful not to touch dry nettles; use gloves or tongs if needed. Drain and set aside. When the nettles are cool, wrap them in a clean dishtowel and pat out as much moisture as possible. In the bowl of a food processor, blend the garlic, pine nuts, salt, and pepper to a paste. Add the nettles, one handful at a time, and the lemon juice and process until finely chopped. With the machine running, slowly pour in the olive oil and process until smooth. Add the cheese and gently blend into the mixture with a spoon. Season with additional Parmesan and crushed red pepper flakes if desired.